Philadelphia Housing Prices Are Up 22% in the Last 12 Months | Econsult Solutions, Inc.
An average Philadelphia house sold for $112K in April (these numbers are seasonally-adjusted, smoothed over time, and adjusted for housing traits), compared to $92K in April 2016. This means that prices are up 6.1% over the last quarter and a whopping 22.2% over the last year. This increase mostly represents skyrocketing demand, though it also includes changes in housing quality, as houses are being built new or rehabbed. This continues the dramatic boom in prices since November 2015. In the 17 months since, prices are up 44% (after years of modest growth, if any). Clearly 22% annual growth in prices can’t continue indefinitely. 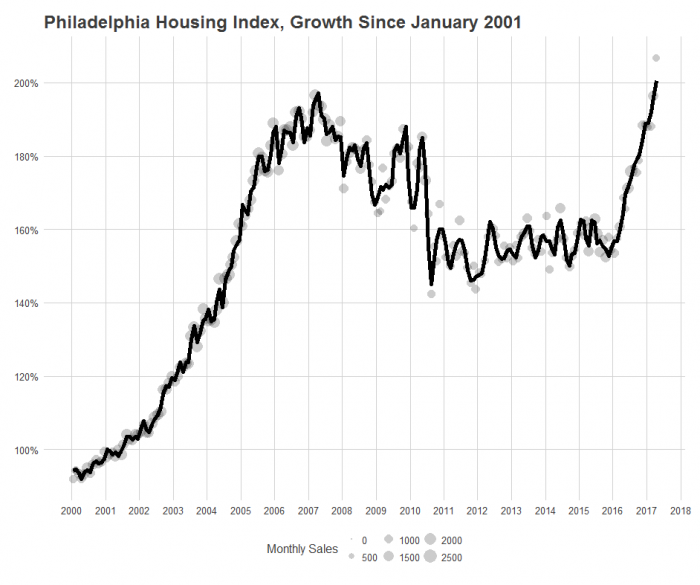 But a less clear question is whether this will settle into steady, strong growth for years, or is this a sign of a Philadelphia Housing bubble? Frankly, I’m of the opinion that trying to guess the market is a loser’s game. Anyone who is too certain of one side is probably over-selling their hand. One argument is that this will all come crashing back down. We saw it in 2008, after all. People are over-leveraging themselves to buy houses, thinking of their houses not as places to live but as investments. They are rushing to buy in Fishtown, in South Philly, in University City before the prices rise too much higher. Nationally, household debt has returned to 2008 levels, (though the share of housing debt is significantly lower this time around). Philadelphia’s recent construction boom could accelerate that if developers are over-predicting demand. But what is the argument that maybe this is the beginning of long, sustained growth? The core is that this boom in prices represents the continued trend of Americans revaluing urban lifestyles. 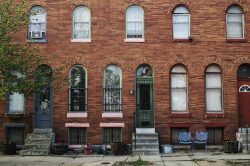 Philadelphia is actually relatively late to the game, as prices have already boomed similarly in New York, Boston, and San Francisco, however, with its walkable streets and distinct neighborhoods, Philadelphia is perfectly suited to attracting new urbanists. Meanwhile, job growth in the Greater Philadelphia Region, which has long lagged other large cities, has finally outpaced the country and a majority of other large U.S. cities. As preferences shift, the pool of people who moved to the suburbs in past generations will start bidding for houses and apartments in the city, adding to the competition among buyers and renters, and driving up values. Even relatively small shifts in preferences can lead to system-wide changes when multiplied by the entire population of our metropolitan region. These new in-movers are probably going to move just to the edge of already-gentrified neighborhoods, causing the gentrified regions in Kensington, West Philly, and South Philly to spread. This is, on net, a good story. These shifts in preferences are likely due to (1) our city becoming a better place to live, with lower crime and better amenities and (2) a decrease in overt racism, as new-comers are willing, or at least less likely to outright reject, moving to the “inner city”. If it continues, however, it does mean that Philadelphia will need to shift its paradigm, from a city desperate to attract residents and investment, to one trying to manage it for the good of all. If we become a city that sees 1% annual population growth, we are going to need more units to house people. The easiest way to keep housing affordable is to have enough housing supply for everyone to live in. There are other ways to manage the shift from struggling city to booming one. The shift exactly matches the recent transition of noted urbanist academic Richard Florida. In 2002, Florida became famous with The Rise of the Creative Class (2002), which argued that cities’ growth depended on attracting a certain group of people, the “Creative Class” (think cafés full of artists and tech workers). These groups especially cherished a certain type of urban lifestyle, and would drive economic development. 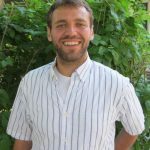 In his new book, The New Urban Crisis, Florida argues that since many cities have successfully recaptured population, resulting in surging housing prices (much to his surprise) it is now time for cities to channel resources to improve economic opportunity for all residents in order to reduce inequality. 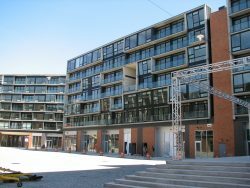 I suggest strategies could include 1) requiring developers to build affordable housing, either as legally defined, or in the form of higher-density, small units that will have low market rate rents; 2) requiring a diversity of types and densities of housing developments in neighborhoods to encourage integration (decreasing segregation); and 3) capturing the boom by taxing new wealth to provide investment in public education, institutions, and infrastructure. Of course, Philadelphia is not in the position of New York or San Francisco yet. And the pessimists who foresee a bubble may be right. But we may also be facing the issues of a boom city sooner than we realize. Econsult Solutions, Inc. provides the Philadelphia Housing Index (PHI) free of charge to the public. Sales are arms-length transactions of single-family homes only. The price indexes are estimated by Econsult Solutions, Inc. using a quality controlled measure of average sale appreciation using hedonic regression analysis.